Homogenous liquid solutions are typically cultivated using a mixing system capable of continually agitating a mixture in a test tube or vessel at sustained speeds. This may require a gentle sloshing motion or rapid centrifugal force depending upon the homogeneity of the mixture and the geometries of any dispersed particles within the solvent media. Conventional laboratory mixing systems include magnetic stirring, which encourages solid particles or dissimilar liquids to disperse in a solvent via radial flow. This method is relatively quick but is limited to small-scale experiments as the magnetic stirring apparatus can only accommodate small containers, thus lower liquid volumes than other techniques. Alternative homogenizers use direct-contact drive shafts to improve the homogeneity of dispersions, but these must be operated by experienced personnel whenever the mixing system is in use. The digital rotator from Glas-Col is equipped with cutting-edge brushless control technology, providing analysts with a unique solution to multiple established laboratory issues. 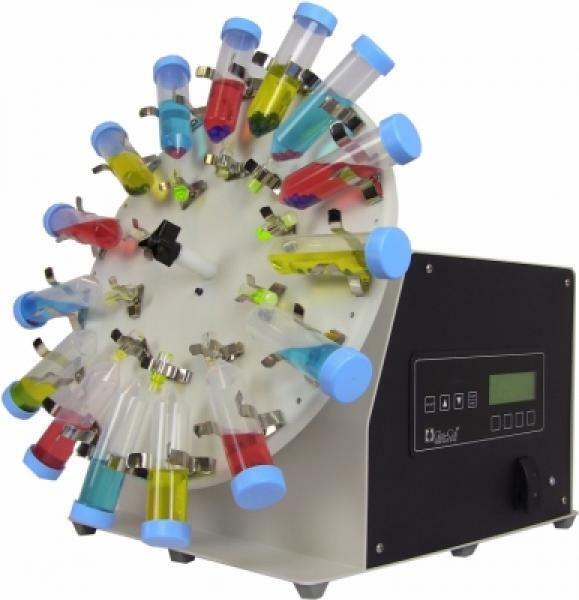 The defining feature of this mixing system is the rotating disc, which can be augmented with variable housings for test tubes and vials of different sizes. Small and large clips can be attached to the disc to facilitate tubes of 10 – 30 mm in diameter, with the option to house vials of multiple different geometries simultaneously and enable concurrent mixing of solutions with varying homogeneities. Each test tube is also easily visible throughout the entire timed or automated event, allowing analysts to visually observe process conditions without interrupting the experiment. The rotating aluminum disc attaches easily to the drive bar that is powered by a robust, continuous-duty motor that can generate speeds of between 5 – 83 rpm. Lower speeds are characterized as a gentle slosh and higher speeds as rapid agitation, and the mixing system can operate across this full range of motion for demanding periods of operation. The simple membrane switch user interface allows analysts to determine rotational speeds to within 1 rpm and pre-define the mixing system’s timing parameters. The instrument is ideal for homogenous mixing of well-characterized materials and solutions, allowing facilities to sustain the distinct mixing conditions required to prevent the precipitation or agglomeration of common solutions. Additional Labnetix® software can be installed to enable remote computer control and real-time data acquisition of experiment conditions, supporting the experimental re-suspension and homogenous mixing of solutions with outstanding degrees of automation. Glas-Col provides a robust range of laboratory instruments for facilities all over the world. Our background in the fabrication of robust heating mantles allowed us to explore the broader possibilities of precision labware and technologies, resulting in a leading-range of heaters, data acquisition instruments, mixing systems, and more. If you would like any more information about our mixing systems, please do not hesitate to contact us.